Good news! You don’t have to earn access to God. Want God to answer your prayers? Want a sense of intimacy with God? Then you have to show you’re serious in your commitment. You need to be doing all the right things and avoiding all the wrong ones. Try harder, believe more, really mean it this time. Not everyone believes this, but a lot of people do. Do you? I certainly believed this for a long time. It’s not hard to see why this kind of belief is so common. In our experience access is earned or paid for. Want to publish a book? You have to have a platform with lots of social media followers. Want to build a platform? You have to provide great content that people find meaningful. Want to get a promotion? You have to perform well and build good relationships with management. 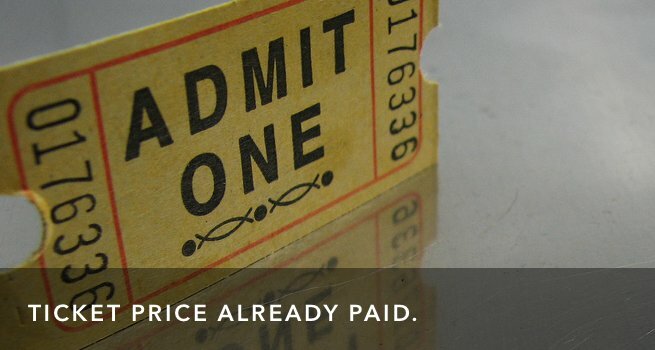 Want a FastPass at Disney so you don’t have to wait in lines? You have to pay for it. If you want access, there’s always something more you have to do. Right? No more temples, priests or sacrifices! Across time we’ve created religions to help us connect to God. Most of these religions have temples, priests and sacrifices. A temple is a sacred place you can go to connect with God. A priest is a sacred person who can give you access to God. A Sacrifice is the price you pay for access. They may go by other names, but the principle is the same. Paul says this access comes to us “in Christ.” We don’t need a certain special place to go where we can find God. Why? Because Jesus is the temple, and we are in Christ. We don’t need a certain special person who can give access to God. Why? Because Jesus is our High Priest, and we are in Christ. We don’t need a sacrifice, a certain special religious ritual to get God’s attention or pay for our sins. Why? Because Jesus made the final sacrifice once and for all. Jesus gives us full access to God. So just believe really hard in Jesus, right? That sounds right. The problem is that there are days when no matter how much you want to, you can’t have more faith. Some days the pain is stronger than our faith. Some days we’re so tired, we’re so beat up that there’s no faith left in us. That’s when this feels empty. The implied message is that you will feel God’s presence in the middle of painful circumstances if you have enough faith. At the end of verse 12 you should see a little notation, a small letter or number, letting you know there’s something down in the footnotes. That notation is there to let you know that the last phrase of this sentence can be translated differently. Most versions translate this phrase as “through faith in Jesus.” That sounds very gospel-y. It’s what we expect. But the phrase ends with a pronoun that can also be possessive. If it’s possessive, the whole phrase changes. Instead of the faith being focused on Jesus (like saving faith), this faith actually belongs to Jesus. It’s his faith. Not what Jesus believes, but his own faithfulness1. Our access to God is not based on anything we’ve done. It’s not a result of the number of faith-units we’ve mustered. 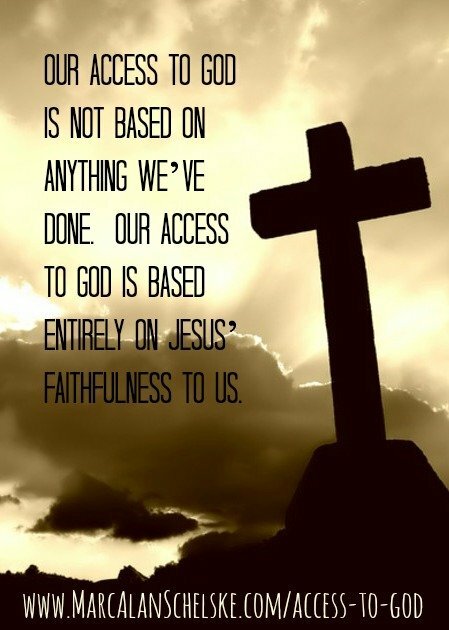 Our access to God is based entirely on Jesus’ faithfulness to us. Did you grow up learning that God would only answer your prayer if you were good enough, or if you believed hard enough? Do you have some left-over shame because once you prayed something really important and it didn’t happen, and you thought it didn’t happen because you didn’t have enough faith? You need to know today that your access to God has nothing to do with how good you are or how faithful or how much you believe. Your access to God is based entirely on Jesus’ own faithfulness. That’s why your circumstances don’t matter. That’s why you can turn painful things upside down and see them as an opportunity for God to work in your life and in the world. This promise isn’t based on your goodness, or your willpower, or your faith. This promise is based on the faithfulness of the One who faithful even to death, the One who will never let you go, the One who can do more than we ask or imagine. Journal Exercise: How has Jesus shown his faithfulness to you? Start with the details and circumstances in your life, but also include how Jesus showed faithfulness in his life, and what that might mean for you. Practice: Next time someone in your life is struggling, don’t tell them to “just believe,” or to trust God more. Tell them that Jesus is with them, and that Jesus will be faithful to them. Instead of admonishing them to try harder, encourage them with the truth of Jesus’ power and faithfulness. Watch: I presented this content in a longer format with more Biblical background at Bridge City Community Church. You can watch that message here. Your access to God is based entirely on Jesus’ own faithfulness. Tweet that. No temple, priest or sacrifice for me. Jesus took care of all that. Tweet that. How have you seen Jesus’ faithfulness in your life?